Stock up on the ample harvest. 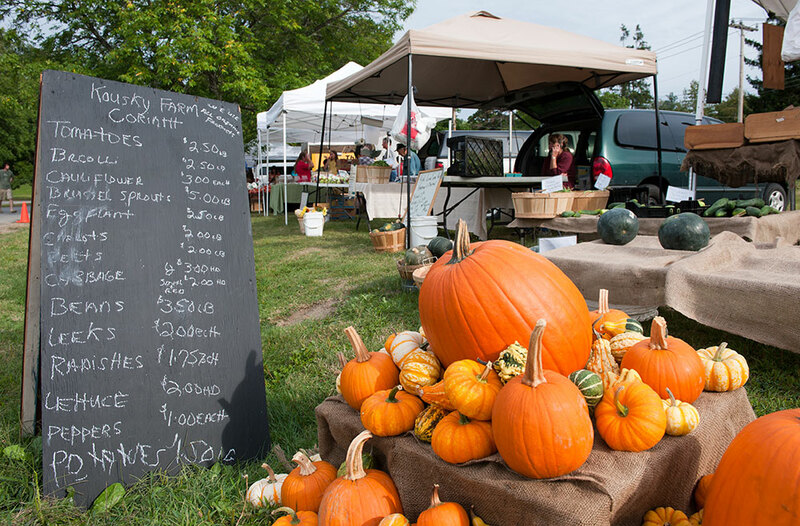 Many farmer’s markets remain open into October and beyond. Take your ghouls and goblins out for a day at the farm! Explore pumpkin patches, take a hayride, get lost in a corn maze or see if you can make it through a haunted house! Search this directory for even more options. Gather up all ye apples! Round up the family and go visit an apple farm or pick your own apples. Soak up the Fall Foliage splendor! 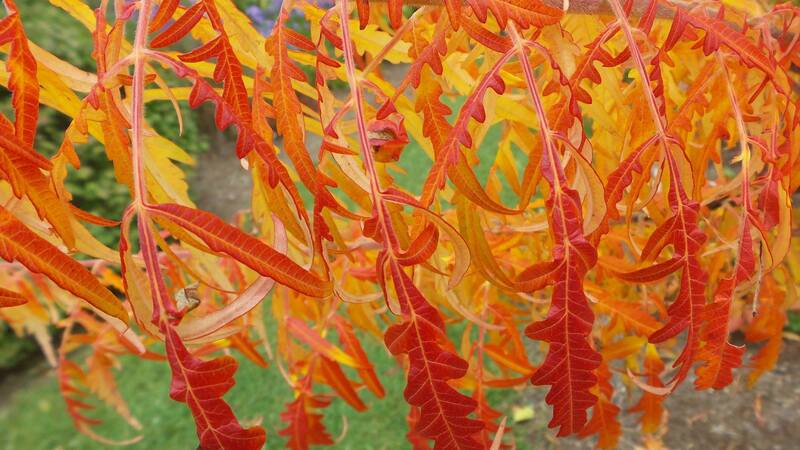 Find out where the leaves are at peak color and learn about the whys and hows of the transformation from green leaves to the rich leaf colors of Fall. Fryeburg Fair! This is Maine’s largest agricultural fair and is chock full of exhibit halls, educational and historical displays, livestock shows, animals, food, rides, and much more! Visit many of Maine’s cheesemakers in their creameries, meet the animals, and learn the stories behind 150+ artisan cheese made in Maine. Be on the lookout for the Maine Cheese Festival on October 15th! Fill up the cupboards! Make up some herbal vinegars or harvest and put up some cranberries. For a different twist, learn about drying as a food preservation method. Got a root cellar? Or looking to keep fresh fruits and vegetables on hand for longer? Proper storage conditions — temperature and humidity — are needed to lengthen storage life and maintain quality. Discover how to extend fruit and vegetables storage times. When will the frost come? Maine’s frost free dates, on average, extend from May 7th – June 17th until August 25th – October 6th. Find out when you can expect the frost to hit (PDF) your neck of the woods. This can help you plan for next Spring’s planting schedule too. Keep houseplants healthy during the winter. Learn some tips about light, watering, and humidity to keep your houseplants healthy. Keep the pruners at bay. 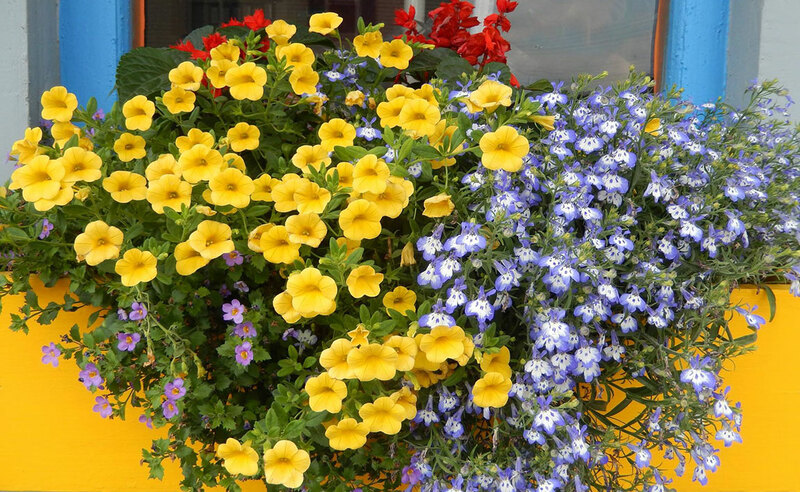 While you may be on a tear to clean up everything and get it all trimmed back and looking neat before winter hits, it is often best for many plants to wait until the plants have gone dormant before pruning them. Pruning them now can signal to them it’s time to put out new growth, instead of preparing for dormancy. Get the scoop on pruning at Pruning Woody Landscape Plants, pruning raspberries, How to Prune a Blueberry Bush, and pruning fruit trees. 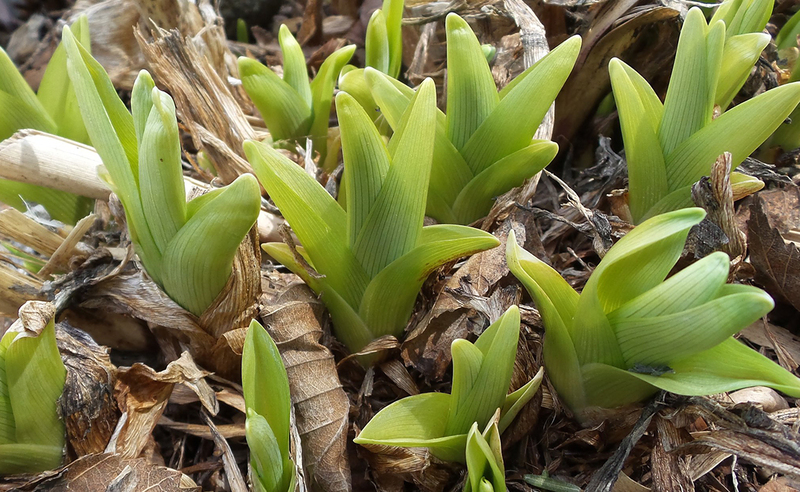 Winterize your gardens — and your equipment. 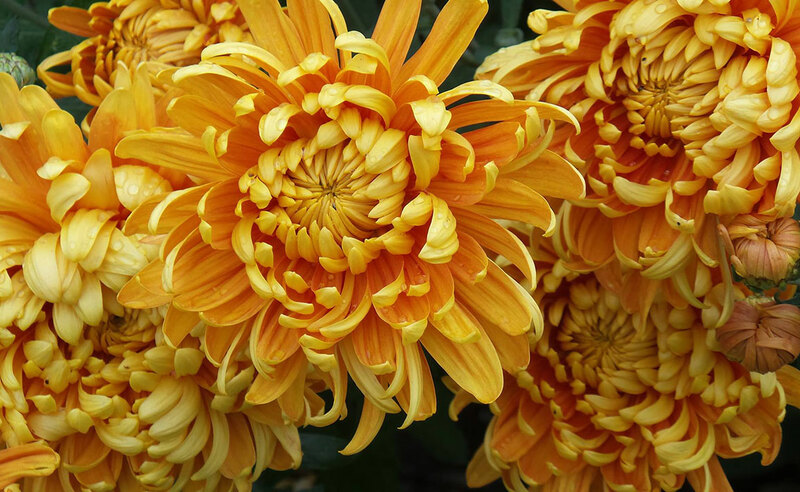 Got dahlias, tuberous begonias, gladiolus? 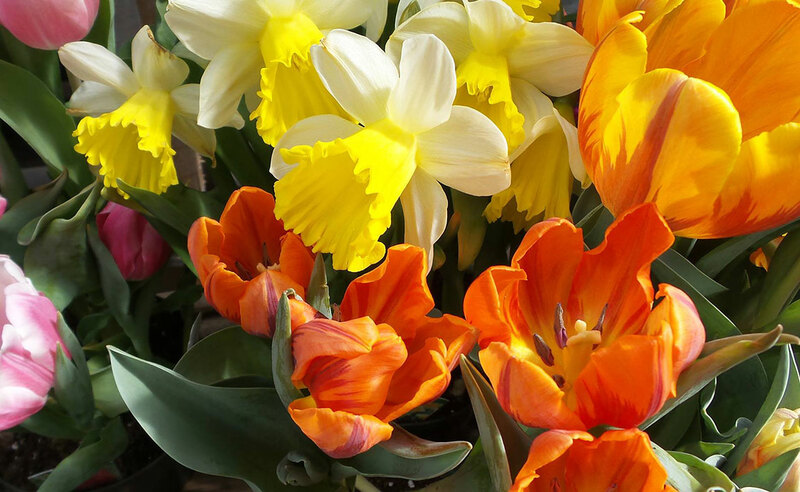 Learn how to store tender bulbs. Ensure a good garlic harvest and plant now. Planting garlic through October allows the garlic cloves time to establish their roots before winter sets in. This gives them the ability to shoot ahead and grow well during next year’s growing season, providing you with an ample harvest. November brings cold weather and an opportunity for farmers who have balsam fir growing on their property to add a little to their farm income. Piscataquis and Penobscot Counties have a number of Christmas tree producers who are looking for brush or balsam fir tree tips for their wreath making operations. If you plan to sell to these folks, it is best to contact them and ask what type of brush they need and how they would like it delivered. Tip gatherers, who plan to collect tips from land that is not their own, must receive permission to use private land whether you intend to sell the tips or use them for making your own wreaths. A fir tip is 12 to 20 inches long. Illustration by Mark A. McCollough. The end portion of a balsam fir branch is called a “tip.” Tip lengths range from 12 to 20 inches. The tip may be broken into two or three pieces. These pieces are placed together to form a tip bunch and wired onto a ring to make a wreath. 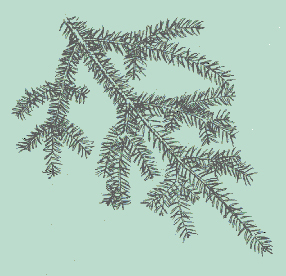 Balsam fir has dark green, blunt-ended needles that are about one inch long. Spruce looks similar to balsam fir, but has shorter needles with pointed ends. This makes the needles “prickly” to the touch. Many wreath producers and home crafters are very selective when buying or harvesting tips, because tip quality largely determines the quality of the finished wreath. Tips should be “rounded” (needles on all sides of the tips’ stems). The needles should be a dark green color, not yellow or brown. The tips shouldn’t have any signs of disease or insect damage. A 4- to 6-foot-long stick used for stacking tips. Illustration by Mark A. McCollough. Once the tips are removed from the tree, they are gathered together. One common tip gathering method is to stack the balsam fir tips into a “stick.” The tip gatherer first cuts down a small tree (four to six feet tall), then strips the tree of all branches except for the last set (located at the bottom end of the tree). These remaining branches are cut four to eight inches in length. The tip gathers use these sticks to transport their tips. Individuals can sell the tips to local buyers (usually a wreath wholesaler or retailer), who provide tip specifications (required tip length, quality, and stacking method). These tips are sold according to their weight. Balsam fir wreaths consist of tips, a metal ring, and wire. A wreath is assembled by attaching bunches of tips to a ring. These bunches are held to the ring with the wire. Our publication on making balsam fir wreaths includes instructions for making double-faced wreaths (wreaths with tip bunches attached to both sides). Single-faced wreaths are made the same way as double-faced wreaths, except tip bunches are attached only on one side. Wreath making methods may vary slightly, depending on the wreath producer. Source: Bulletin #7011, Balsam Fir Tip Gathering and Bulletin#7012, Making Balsam Fir Wreaths. I am a Buttonbush and happy to be! The whimsical, fragrant, spherical, ball-shaped flowers heads of Cephalanthus occidentalis (buttonbush) remind me of something that may have come straight out of Dr. Seuss’s famous book the Lorax. 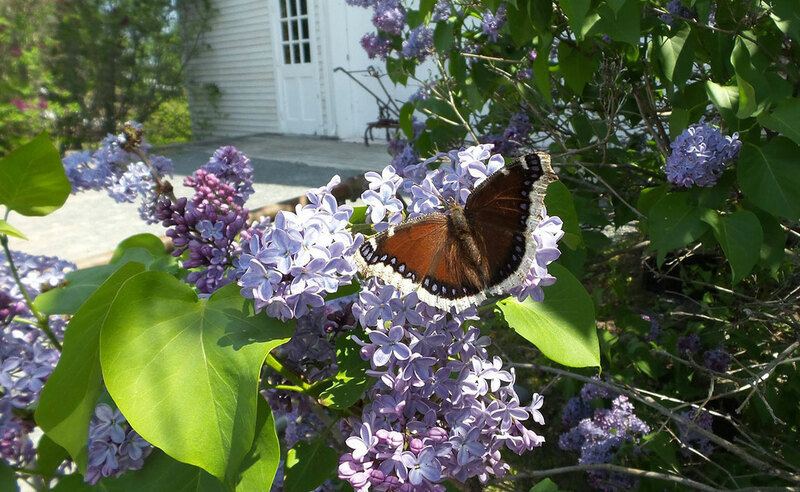 The flowers are unique indeed, but not the only standout feature of this native Maine shrub. 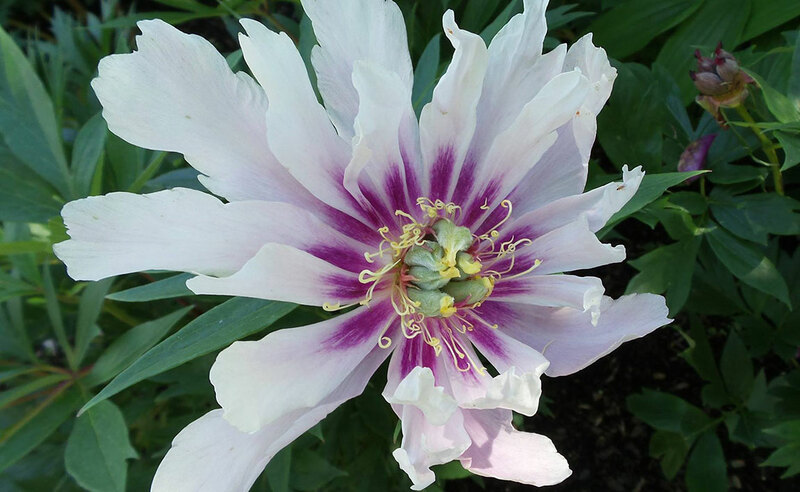 The Genus name comes from the Greek words cephalo (head) and anthos (flower). Cephalanthus is a shrub that has it all. This hardy, deciduous, 6-12’ tall shrub, with a nearly equal girth is incredibly adaptable. It grows best in wet soils including, low woods, thickets, swamps, stream/pond margins, and shallow standing water, thus making it ideal for rain gardens, naturalized areas, slope stabilization, and other challenging sites. 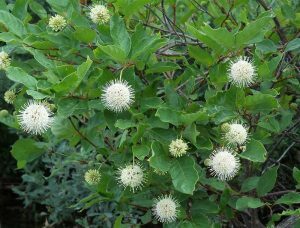 Meanwhile, buttonbush can also tolerate sites with normal to slightly dry moisture conditions if provided with ample water during the first growing season. Buttonbush grows best in full sun to part shade. Cephalanthus is an excellent choice as a food, forage, and shelter resource for all sorts of wildlife — supporting over 24 species of birds, bees, and butterflies. 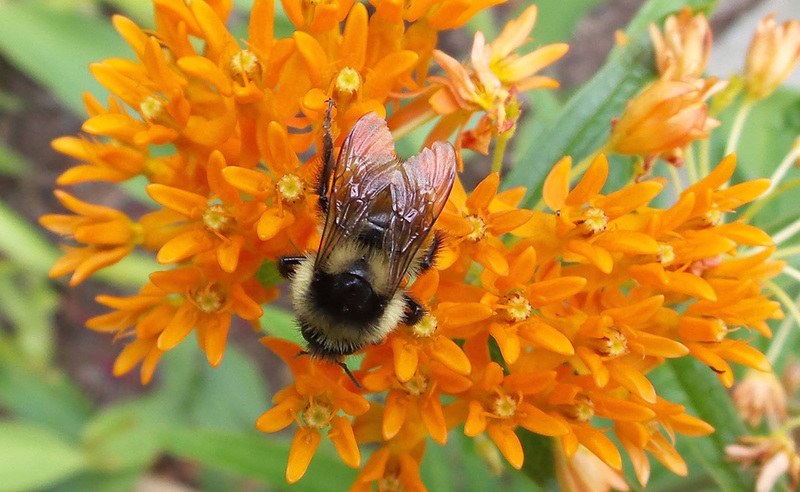 Long blooming flowers provide ample nectar for bees, butterflies, and hummingbirds throughout the summer. Flowers fade in the fall, maturing into seed heads or little brown balls, which contain nutlets. Each buttonbush fruit can produce up to four hundred seeds. Seeds heads persist well into the winter, giving this shrub year round interest, and are also a favored food of waterfowl. Leaves provide larval food for the Aellopos titan (Hummingbird moth) and Darapsa versicolor (Hydrangea moth), and the lower branch structure is used by wood ducks as protection for their brooding nests. Low maintenance is another appealing feature of this shrub. It requires little to no pruning and is relatively disease free. Any pruning desired for the purposes of shaping is best done in spring. 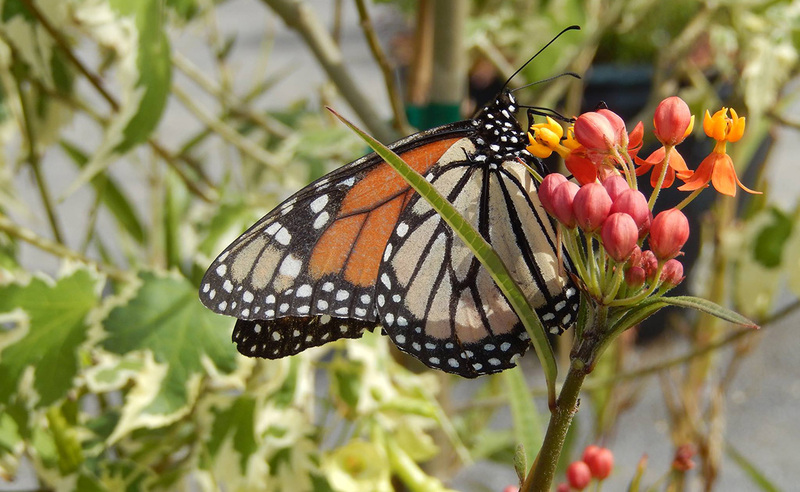 It is hard to imagine a shrub that does so much, delighting humans with fanciful flowers and so many birds and pollinators with needed food and shelter, and needs so little in return. Three proud participants in the Piscataquis Passport Project. Photo by Trisha Smith. The Piscataquis Passport Project evolved from a “Market Kids” 4-H program in Penobscot County. Its purpose was to increase participation in Free Summer Meals, encourage kids to visit the library and farmers’ market, and help in the school garden. Planning began in January when Piscataquis Healthy Food for All coordinated meetings with Maine Department of Education, food service directors and managers, University of Maine Cooperative Extension, and other interested community members. Free Summer Meals are supported by Maine Department of Education to help mitigate hunger during summer vacation. Anyone under 18 can get a free, nutritious meal at any designated Free Summer Meals site. In Dover-Foxcroft, both breakfast and lunch were available Monday through Friday at Sedomocha School. Sedomocha’s kitchen manager provided additional meals for distribution at other sites as well. Kids carrying Passports got them stamped or initialed when they attended a Free Summer Meal or other listed activity. Those who brought their Passports to Dover Cove Farmers’ Market received $5 in “Veggie Vouchers” to spend on fresh vegetables and fruits as well as a stamp in their “Visit DCFM” column. Helpers in the school garden often went home with food they had harvested themselves. Some families discovered the Free Community Dinners held at various churches every Monday in Dover-Foxcroft. Thompson Free Library entertained and educated kids with a series of special guests and activities. Mayo Regional Hospital served Free Summer Meals on “Mayo Mondays,” hoping to make visiting the hospital less intimidating. An “Other Fun Stuff” column contained suggestions for additional activities. At the end of summer, participants returned their Passports to the Extension office to win a prize. Passports required parent/guardian permission, and registration was limited to two days at Sedomocha. Twenty-six kids received Passports, and 6 were awarded a prize for returning their Passport to the Extension office (they were returned as keepsakes). Numbers and prizes are not the only measures of success, however. 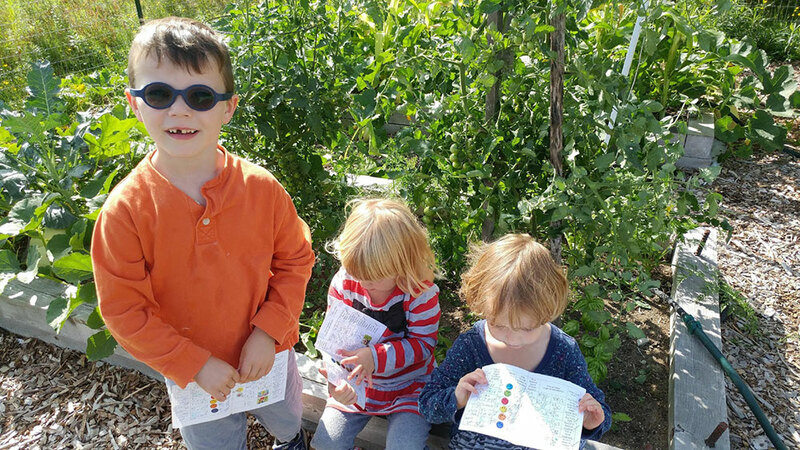 Several families discovered the school garden, shopped at the farmers’ market for the first time, or found new connections in the community. With some tweaks, the Piscataquis Passport Project will return next summer to Dover-Foxcroft and may expand to other towns in Piscataquis County or beyond. For more information contact trisha.smith1@maine.edu or call 1.800.287.1491 (in Maine) and ask for Trisha. With frost on the pumpkin, many home food preservers are storing canning equipment until spring. Before packing up and forgetting about those items that served you so well this past preserving season, take time to give them a little tender loving care! You will be so glad you did next year when you see those first signs of vegetables in the garden and fruits beginning to ripen. First, start with your biggest investment, the pressure canner. For safe operation next season, clean the vent and safety valve. To clean the vent, draw a clean string or narrow strip of cloth through the opening. Check to make sure the safety valve is free of debris and operates freely. Clean the valve by removing, if possible, or following the manufacturer’s instructions. If your canner has a dial gauge, go ahead and mark your calendar now for a time to have your gauge tested in early spring. Contact your local UMaine Extension county office for information on checking the accuracy of the gauge. This should be done well in advance of canning season so that if the gauge tests off more than 2 pound of pressure at 5, 11, or 15 pounds, it can be replaced. Find your closest location to have your dial gauge tested. Follow the manufacturer’s directions for care of the sealing edges of your canner. If your canner has a dial gauge, be careful not to immerse the gauge when cleaning. The darkened surface on the inside of an aluminum canner can be cleaned by filling it above the darkened line with a mixture of 1 tablespoon cream of tartar to each quart of water. 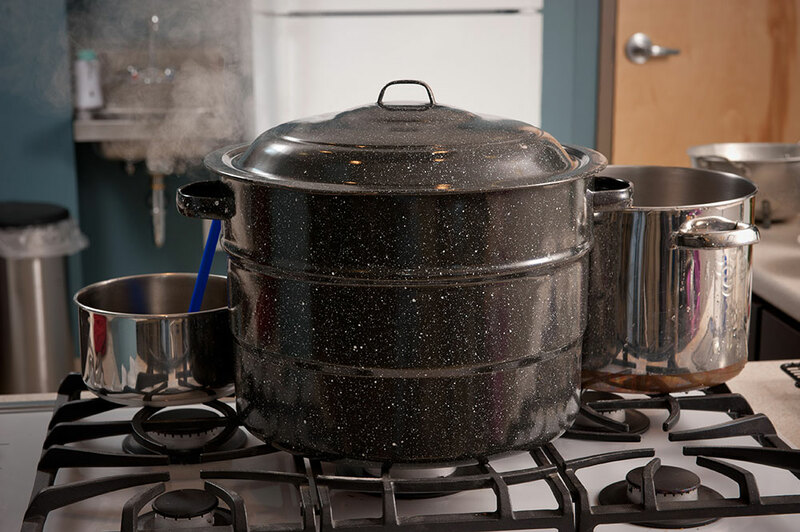 Place the canner on the stove, heat water to a boil, and boil covered until the dark deposits disappear. Sometimes stubborn deposits may require the addition of more cream of tartar. 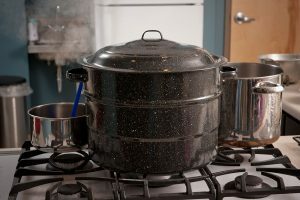 Empty the canner and wash it with hot soapy water, rinse and dry. Hint: deposits from hard water may be reduced if you add 1 tablespoon of white vinegar to the water in the canner while you process your jars. Store the canner with crumpled clean paper towels in the bottom and around the rack. This will help absorb moisture and odors. Place the lid upside down on the canner. Never put the lid on the canner and seal it. Once your canner is properly stored, take time to inventory jars and two piece lids. If properly used and stored, jars can last indefinitely. As you empty jars during the winter, check for any chips or breaks, wash and store in a safe place. Two-piece lids consist of a flat metal disc and a separate metal screw band. After canning, screw bands should be removed once the jars have sealed, instead of leaving them on the jars during storage. Wash and dry the screwbands completely and put them away in a dry place. Bands can be used over and over, unless they rust. The flat lid is used only once and then discarded after the jar of food is opened. Designate a clean and dry storage area for your canning equipment and utensils. Use clear storage boxes, stackable racks, and other organizer accessories to make a food preservation storage center. Come spring, you’ll be ready for another year!